Scientists like Princeton Professor Robert Socolow are depressed because they had to move the Doomsday Clock one minute closer to midnight. Did you know there was a Doomsday Clock? Well, it’s not a real clock that ticks down the remaining moments in hours and minutes and seconds, but a figurative clock that’s pushed towards armageddon by the evil forces of nuclear proliferation, climate change, and biological weaponry. The responsibility of setting such a momentous timepiece falls on the group of distinguished scientists known as the Bulletin of Atomic Scientists. On January 10th the latest tick-heard-’round-the-world took place, as the Bulletin, not satisfied with the direction humanity is moving, moved the minute hand one minute closer to midnight. That makes it 11:55 – we now have just five minutes left. While five minutes may have no real, hard conversion to actual time, one thing we can conclude is that the Bulletin is less optimistic about the world’s state of affairs than they were back in 2007 when they’d actually added a minute to move the hand to 11:55 from 11:56. The favorable minute was in response to international talks in Copenhagen which had resulted in agreements to take steps to fight climate change and to reduce world nuclear stockpiles. Taking back that minute means the Bulletin is none too happy about how those pledges never really led to action. 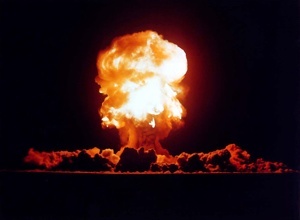 Other gripes the group has include the failure of the US and China to ratify the Comprehensive Test Ban Treaty which would prohibit nuclear explosions “by everyone, everywhere,” the failure of governments to adopt climate change agreements to reduce carbon emissions, and the failure to vastly increase public and private investments in alternative energy sources such as solar and wind. “Faced with clear and present dangers of nuclear proliferation and climate change, and the need to find sustainable and safe sources of energy, world leaders are failing to change business as usual,” condemned Lawrence Krauss, BAS co-chair and a man seemingly at the center of every society and science debate over the past decade. “The global community may be near a point of no return in efforts to prevent catastrophe from changes in Earth’s atmosphere,” despaired Allison Macfarlane, member of the Blue Ribbon Commission on American’s Nuclear Future. “The world still has over 19,000 nuclear weapons, enough power to destroy the world’s inhabitants several times over,” alerted Jayantha Dhanapal, former UN under-secretary-general for Disarmament Affairs. The inauspicious ticking of the hand comes at a time of increased assassinations, bombings, and cyber attacks against Iran, allegedly orchestrated by Israel and, to a lesser extent, the US, to curb Iran’s nuclear weapons program. Maybe heads of state were looking at the Doomsday Clock, terrified that the group of accomplished scientists will continue their stubborn march towards the apocalypse lest they do something about it. Set the bomb, minus the world one Iranian nuclear physicist, check the clock. Damn, still just five minutes to go. The clock was devised back in 1947, in the earliest days of the nuclear arms race. It’s since been reset 20 times, reaching two minutes to midnight in 1953. Perhaps back then, before the Internet gave us all the news sources that inundate us now with the same message a thousand times over it was useful for prominent scientists to come together and deliver a unified message. No one wants a nuclear holocaust. No one wants the world to overheat. No one wants to be using the same sources of energy a hundred years from now, save some oil company CEOs. But I’d like to think that with the amount of media attention and international bickering these issues get, we don’t really need a bunch of Nobel Laureates to show us that our time’s almost up – for now. The world needs smart scientists to do smart science, not tell us that the world is about to end. We already have enough of those, don’t we?